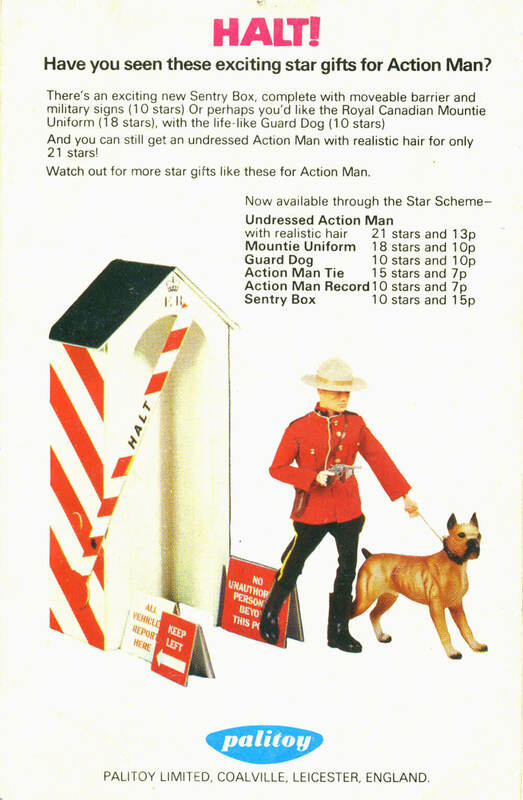 The Action Man Royal Canadian Mounted Policeman (RCMP or 'Mountie) uniform was part of the successful Palitoy Star Card incentive scheme, which launched with the first Action Soldier in 1966. 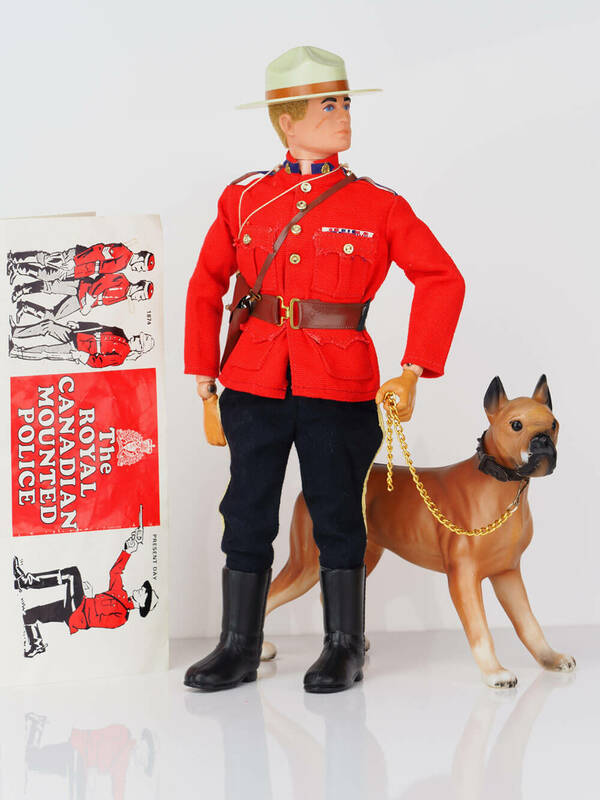 The Action Man Royal Canadian Mounted Police uniform was first offered in exchange for a star card with 18 stars that could be sourced from cutting from packaging and accessory cards. 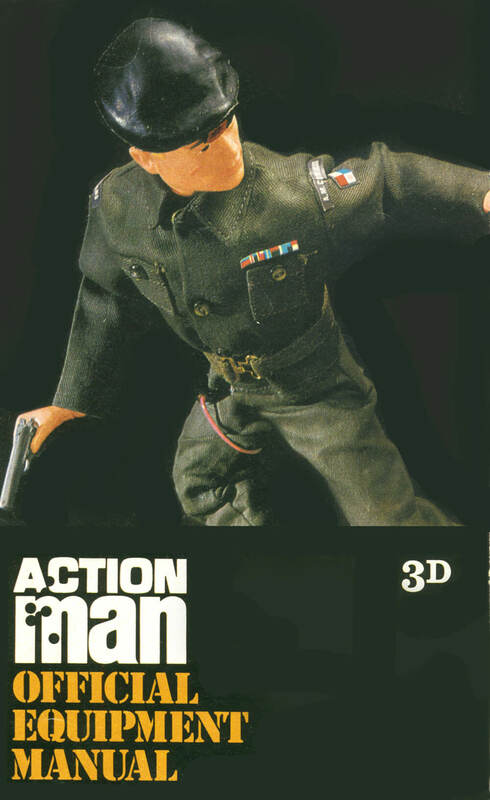 The star card scheme originally offered only an unclothed Action Man for 21 stars. 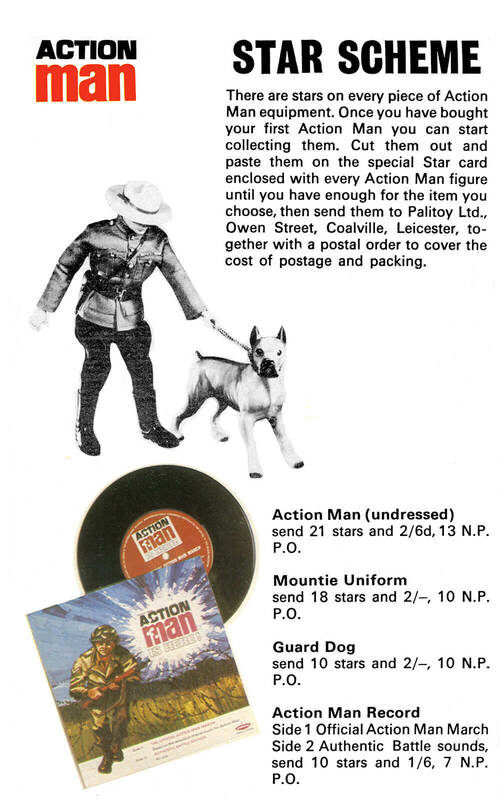 The Mountie Uniform crops up for the first time alongside guard dog (named Brutus) on the star card of c.1968. 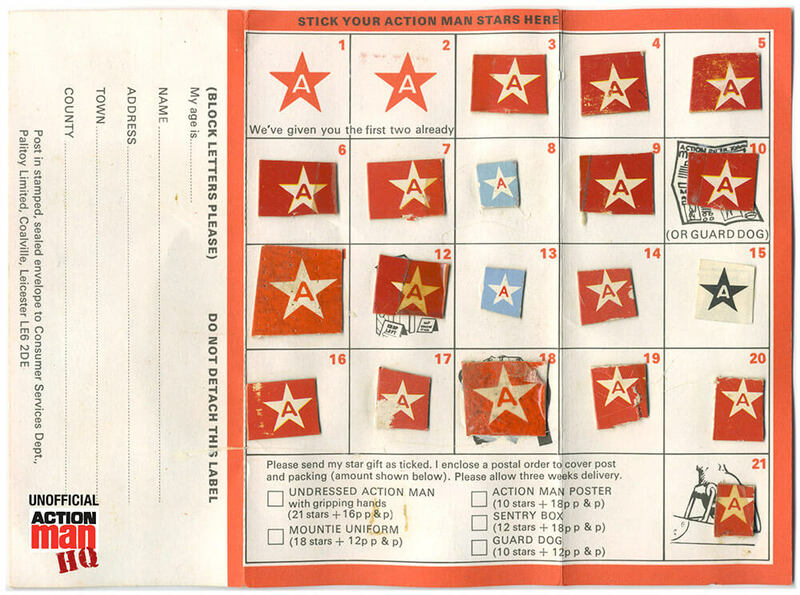 Sadly this is why many vintage boxes have missing rectangular holes in their corners - an all too common sign that stars have been cut out. 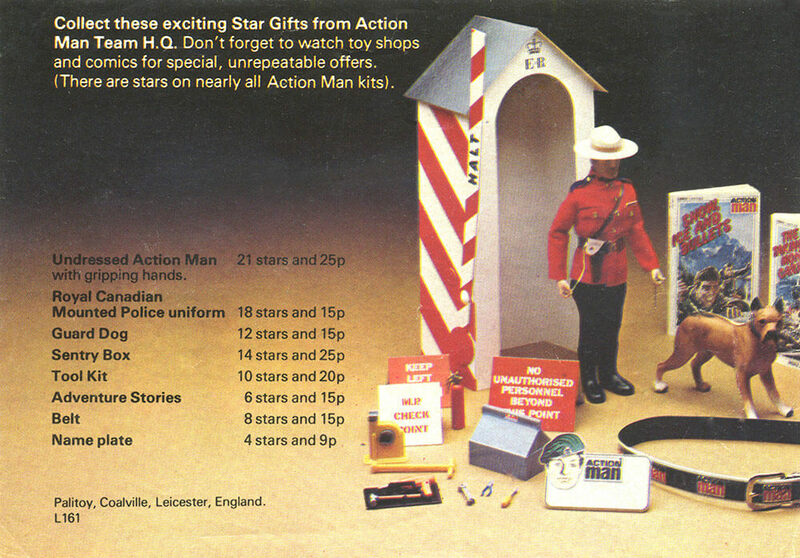 The Mountie isn't mentioned on Star Cards or within the Equipment Manuals much past 1978. 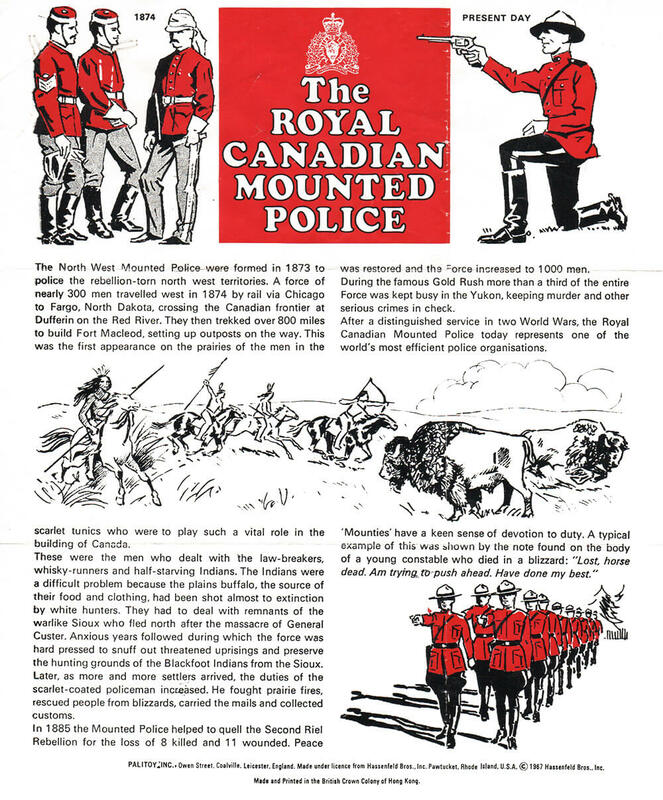 ROYAL CANADIAN MOUNTED POLICE: Tunic, riding breeches, jackboots, belt and cross-belt, holster, revolver with string lanyard, hat, information leaflet. 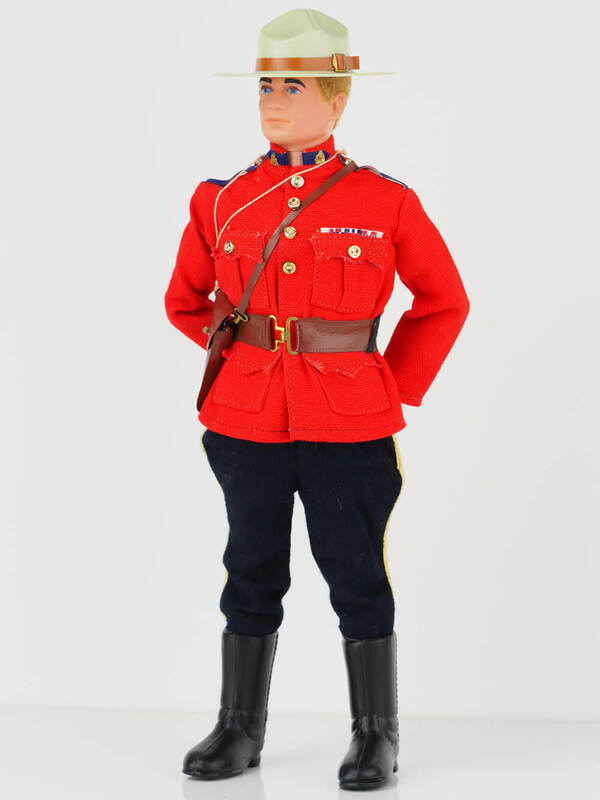 Equipment Manual. 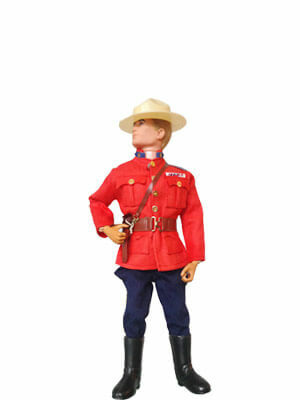 The Action Man Royal Canadian Mounted Police is a very common outfit being one of the gifts in the Star Scheme. 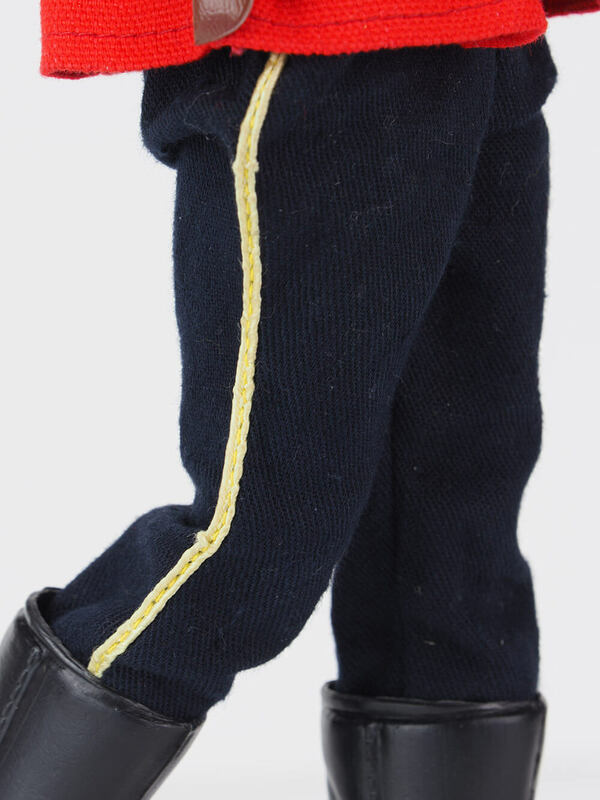 The uniform was originally a heavier fabric than subsequent ones. 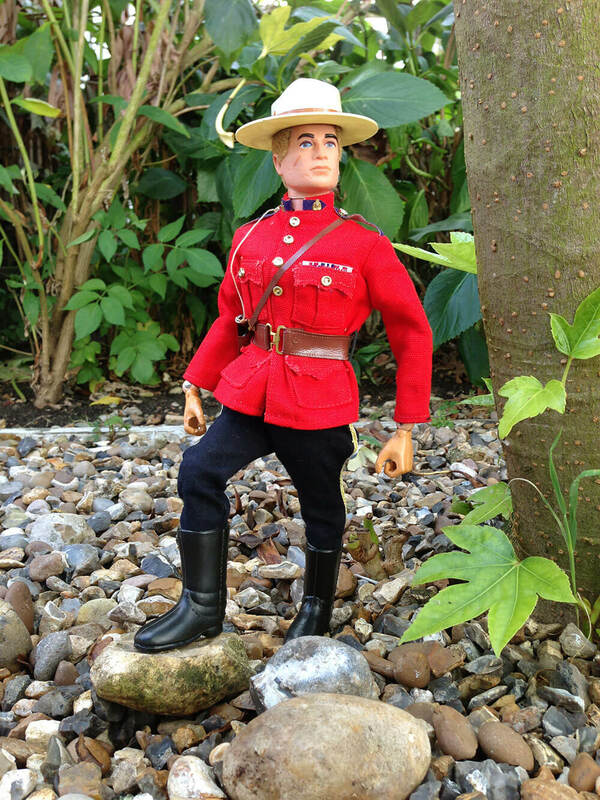 Over a long production period, different shades of colour, button type, hemming (or not) and detailing are evident. 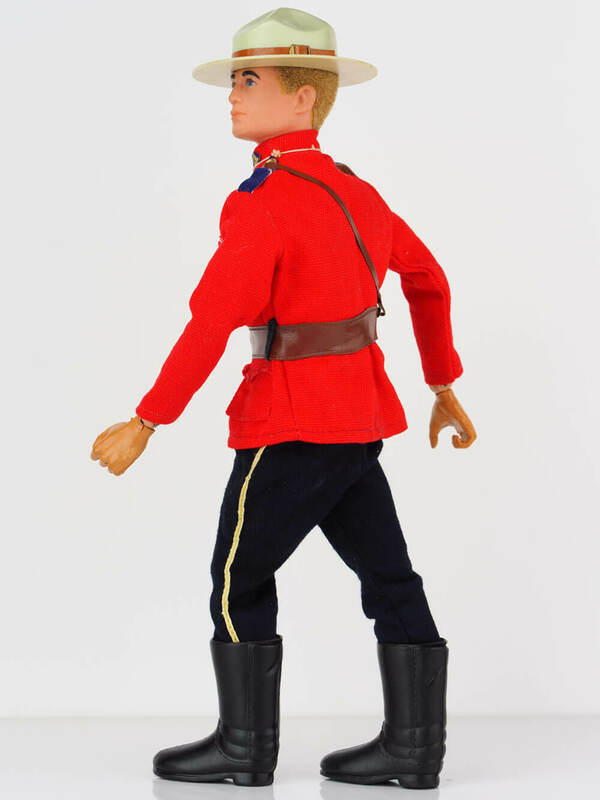 The boots are the type supplied first with the German Stormtrooper. 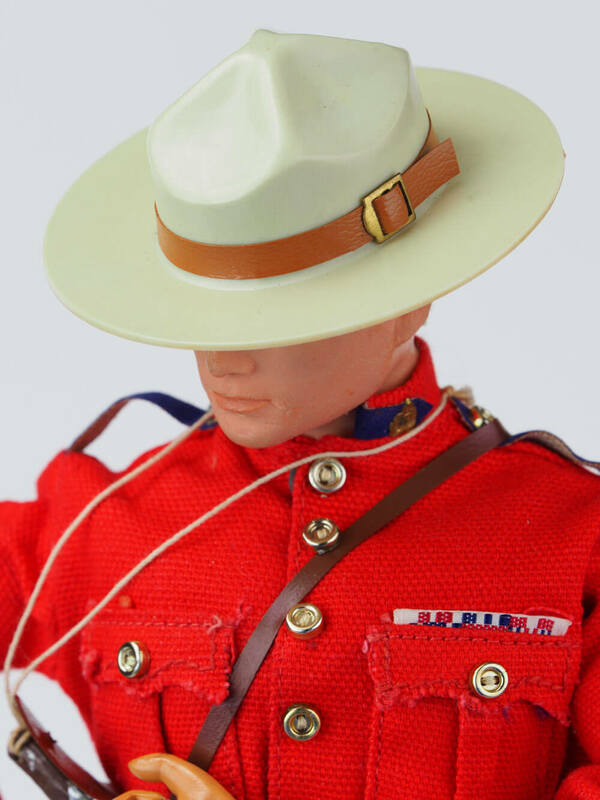 The hat has a band that slips off and is often missing. 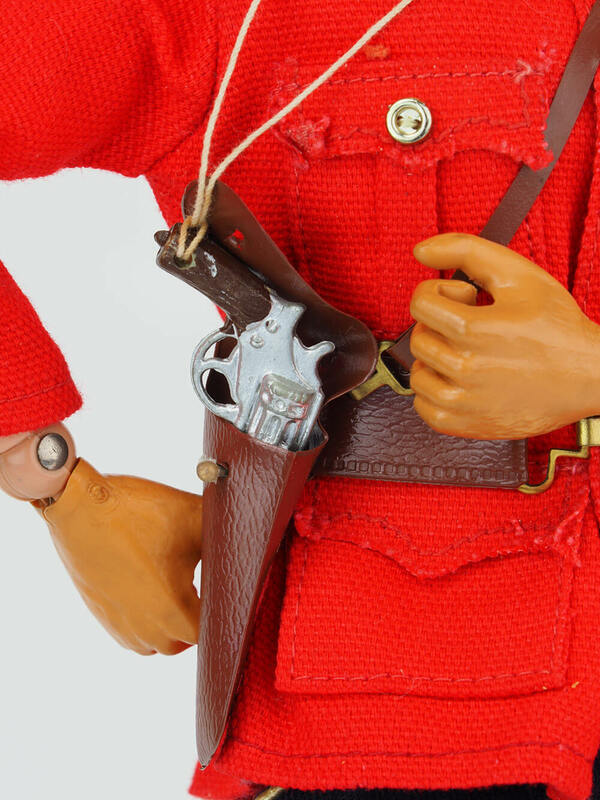 Collectors have mentioned making a new one from the strap of the brown vinyl field telephone bag. 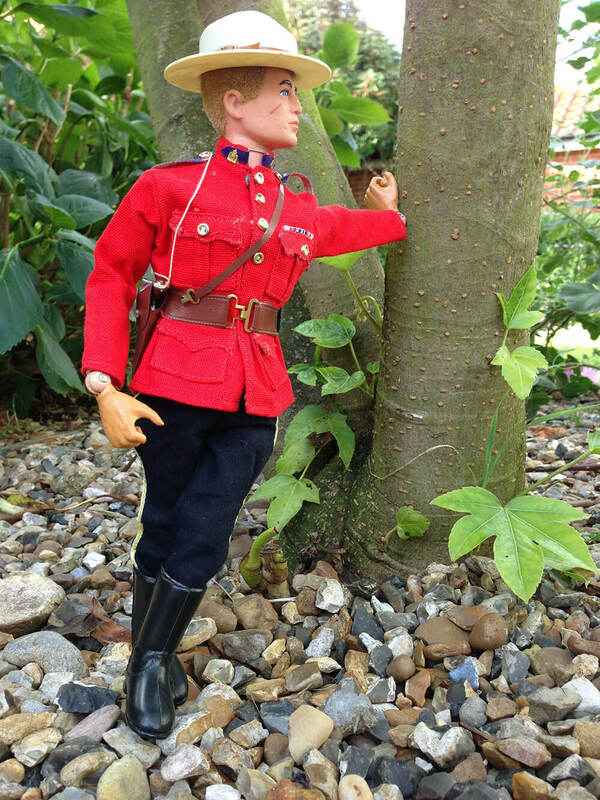 The belt and cross belt is a different type than that of the British Officer's 'Sam Browne' and the holster is worn on the right hip. 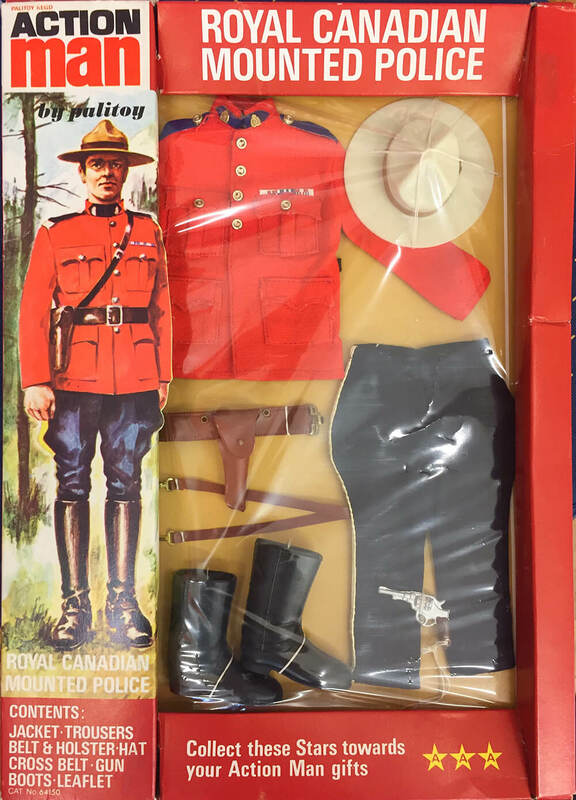 The RCMP set was also made available in a tray type display carton (see 40th Anniversary version below) for a period but does not appear in the Equipment Manuals in such a way.